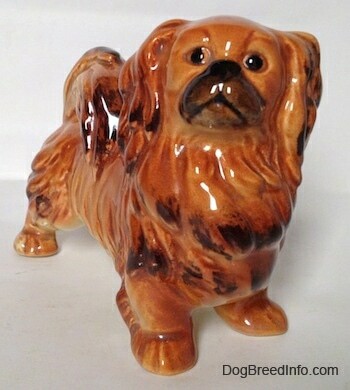 This is a vintage 1950s Goebel brown and tan Pekingese dog in a standing pose. 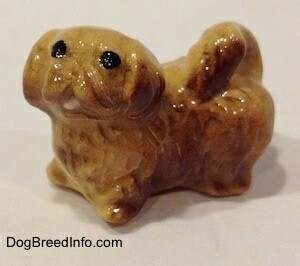 The nose, eyes and snout are black. 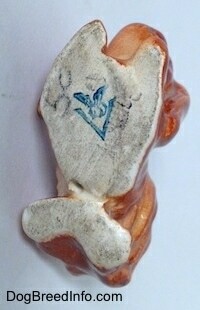 On the bottom is the trademark 2 (TMK-2) Goebel logo of the full bee inside the V stamped in blue. To the left of the blue stamp is a black stamp that reads Germany. 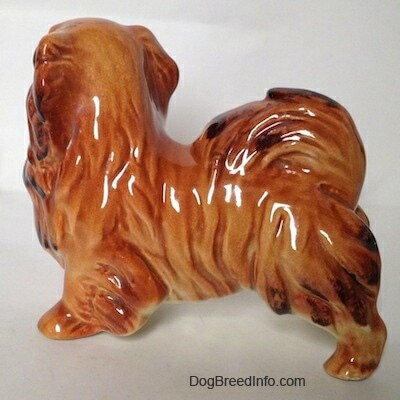 It measures 3 3/4 inches tall from the ground to the top of the head, 4 1/2 inches long from the nose to the back legs and about 2 inches wide across the front. 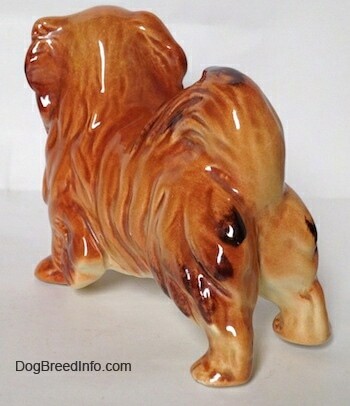 Vintage 1950s Goebel brown and tan Pekingese dog in a standing pose—image showing the trademark 2 (TMK-2) Goebel logo of the full bee inside the V stamped in blue. To the left of the blue stamp is a black stamp that reads Germany. 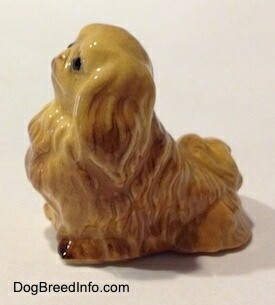 This is a 1950s Goebel brown Pekingese dog in a play bow pose. 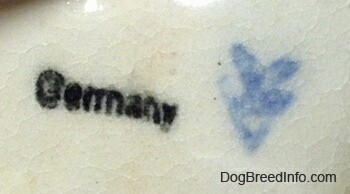 On the bottom is the trademark 2 (TMK-2) Goebel logo of the full bee inside the V stamped in blue. To the side of the blue stamp is a black stamp that reads Germany. 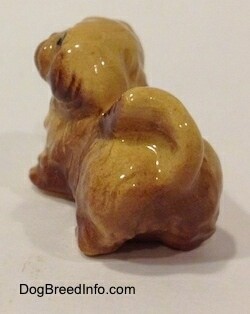 This is a very small figurine measuring 1 inch tall from the ground to the top of the tail, 1 1/2 inch long from the front of the face to the back of the tail and 3/4 inch wide from ear to ear. 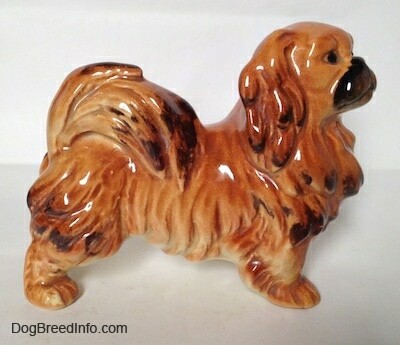 1950s Goebel brown Pekingese dog in a play bow pose—image showing the trademark 2 (TMK-2) Goebel logo of the full bee inside the V stamped in blue. To the side of the blue stamp is a black stamp that reads Germany. 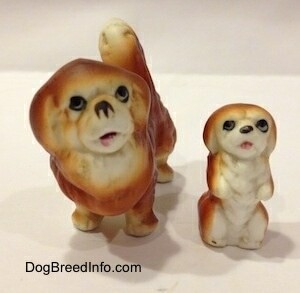 This is a line-up of the different color variations of the Hagen-Renaker miniature “Pekingese Facing Right” designed by artist Helen Perrin Farnlund. 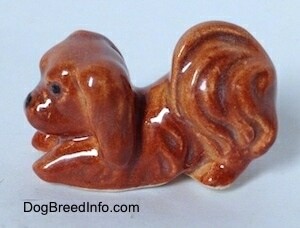 It is item number 33 and was first put on the HR line in 1962 and retired in 1971. 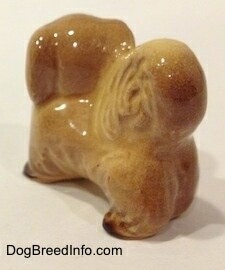 This is a HTF (hard to find) figurine. 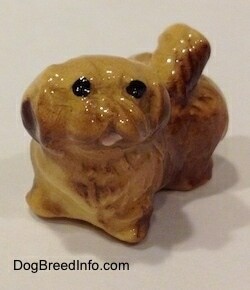 It comes in various shaded of tan, brown and black. 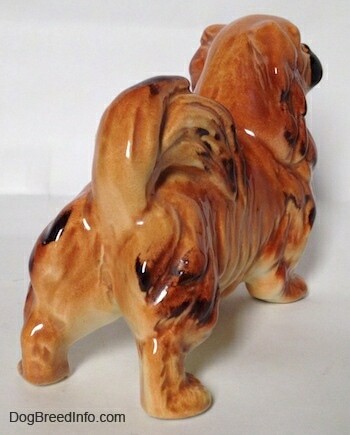 The dog is in a standing pose with his tail fluffed out over his back. It is 1 1/4 inch tall from the ground to the top of the tail, 1 1/4 long from the back of the tail to the front of the face and 3/4 inch wide. It was made in the USA. 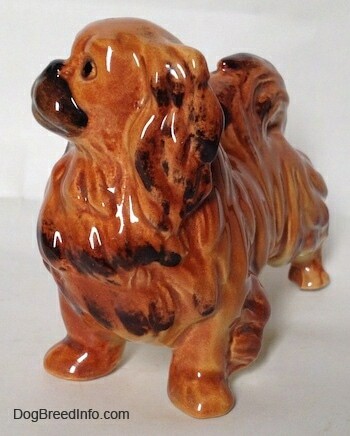 This miniature Hagen-Renaker of “Pekingese Facing Right” designed by Helen Perrin Farnlund is item number 33. 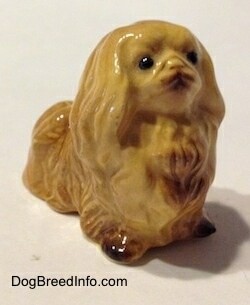 It was first produced in 1962 and was retired in 1971. 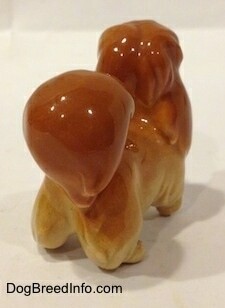 This is a VHTF (very hard to find) figurine. 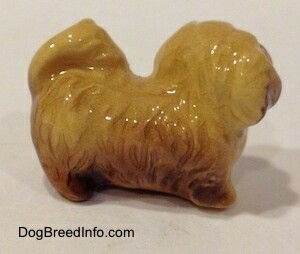 It is shades of tan and brown with a dark brown nose and black eyes. 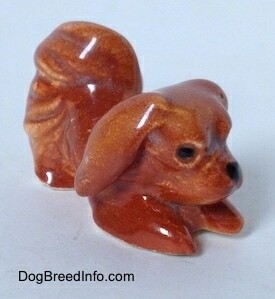 The tips of the paws are dark brown matching the nose. 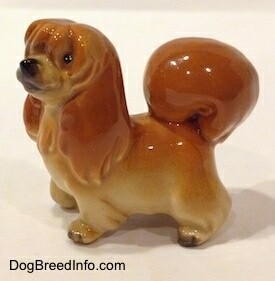 The dog is in a standing pose with his tail fluffed out over his back. 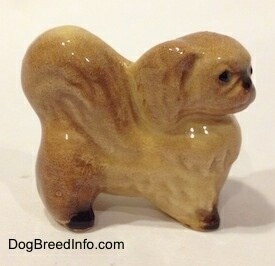 It is 1 1/4 inch tall from the ground to the top of the tail, 1 1/4 long from the back of the tail to the front of the face and 3/4 inch wide. It was made in the USA. 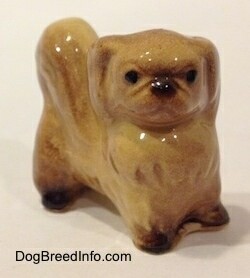 This miniature Hagen-Renaker of “Pekingese Facing Right” designed by Helen Perrin Farnlund is item number 33. 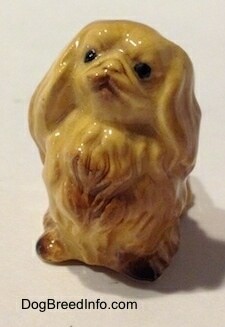 It was first produced in 1962 and was retired in 1971. 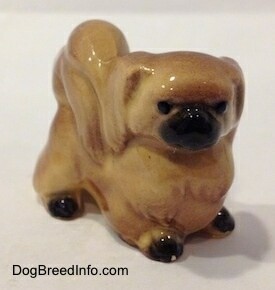 It is shades of tan and brown with a black snoot and black eyes. 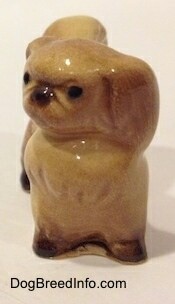 The tips of the paws are black. 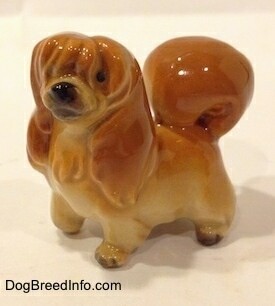 The dog is in a standing pose with his tail fluffed out over his back. 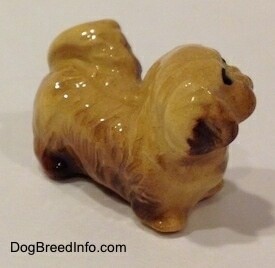 It is 1 1/4 inch tall from the ground to the top of the tail, 1 1/4 long from the back of the tail to the front of the face and 3/4 inch wide. 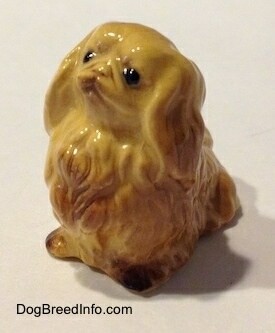 This figurine was purchased at a flea market in the early 1990s. It was made in the USA. 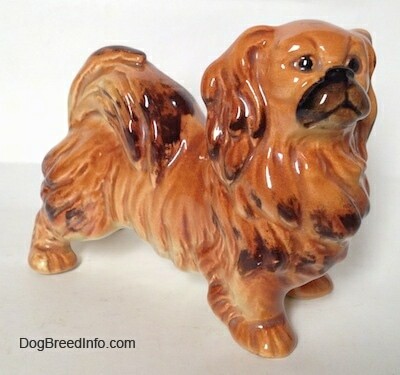 Pictured are the retired miniature Hagen-Renaker of “Pekingese Facing Right” adults with the retired Hagen-Renaker miniature “Pekingese Pup Seated” puppies. 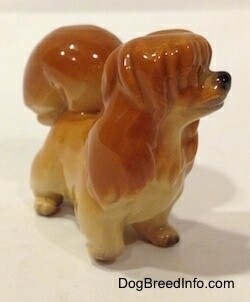 Vintage Hagen-Renaker miniature figurine of a Pekingese dog—this little tan dog is HTF (hard to find) in the collector world. 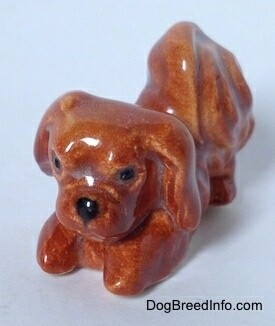 It is item number 3013 and was first put on the HR line in 1991 and retired in 1993. It's just a little thing standing at 1 1/4 inch tall from the ground to the top of the head, 1 1/2 inch long from the front chest to the back of the tail and 3/4 inch across the front of the chest. 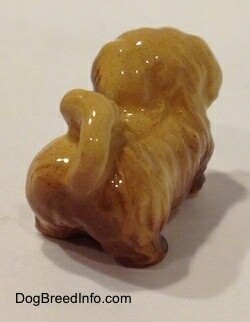 It has a sweet little face, nicely detailed with a glossy finish. It was made in the USA. 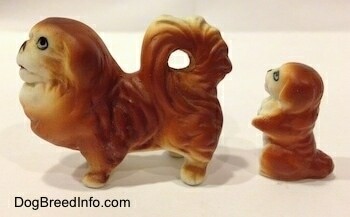 Miniature vintage bone china Pekingese dogs set of a mother and puppy. 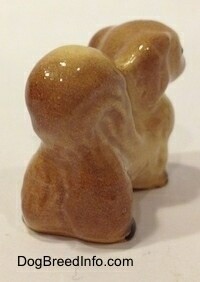 Both pieces are translucent when held up to the light. 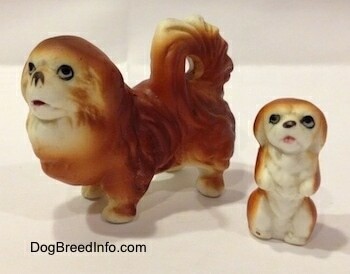 The faces are hand painted; their colors are red/brown and white. 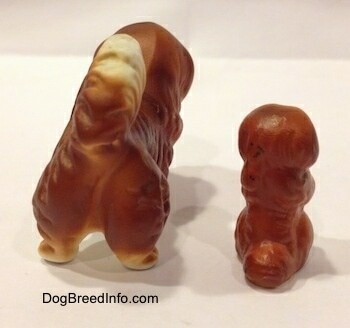 The mother stands 1/12 inch from the ground to the top of the tail, 2 inches long from the furthest point on the chest to the back of the tail and 3/4 inch wide across the back legs. 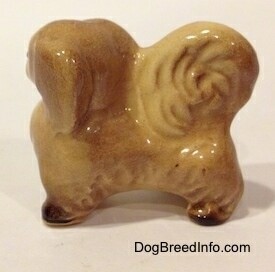 The little puppy is 1 inch tall from the ground to the top of the head, 1/2 inch long from the back of the tail to the front of the chest and 1/2 inch wide from hip to hip.